Jason Brouwer tells us about the killer protein he has been working on, at the Walter and Eliza Hall Institute, for his PhD. It’s Halloween! 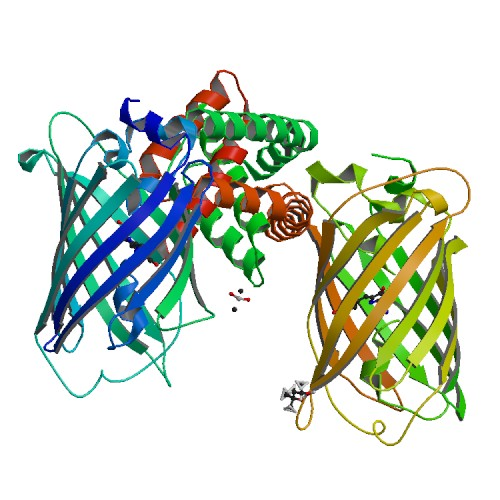 And fittingly today’s crystal structure is the ‘Grim Reaper’ of cell biology, a protein called ‘Bak’. 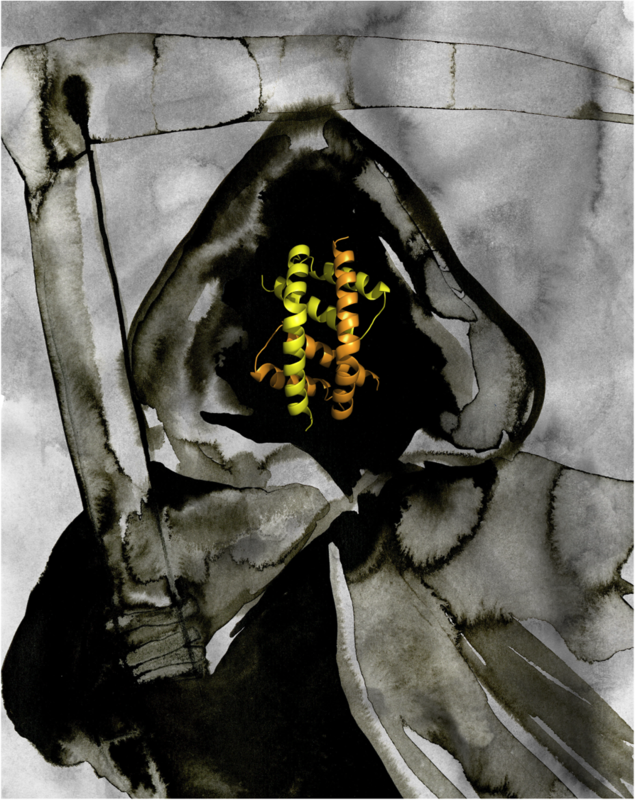 Water-colour painting of the Grim Reaper by Rachel Bucknall, with the BH3:groove dimer structure of Bak as the face. The structure was generated using pymol. Although you may not notice, billions of your cells die every day. This is a highly ordered process called apoptosis and is essential for the development and maintenance of our bodies. Apoptosis is the programmed death of stressed, damaged or unneeded cells. When it is disrupted it can result in the unwanted survival of cells, as in cancer, or unwanted loss of cells, as in degenerative diseases. Therefore we want to study exactly how cells die in order to further understand these diseases. I study the proteins that control cell death, in particular the ‘killer protein’ Bak. Bak sits on the outside of the mitochondria, which are the energy factories of the cell. When the cell gets a signal to die, Bak is activated and interacts with other active Bak molecules to building large structures called oligomers that break open the mitochondria. This flood of contents from the mitochondria is a point of no return and the cell is committed to death. The crystal structure above captures a building block of the Bak oligomer, the BH3:groove dimer. The conserved BH3 domain of one Bak molecule sits in the hydrophobic groove of another. This forms a very strong, symmetric interaction that is essential for Bak mediated cell death. The structure is from the publication Brouwer et al. in Mol Cell 2014 [55(6): 938-946], PDB accession code 4U2V. X-ray data was collected on the MX2 beam-line at the Australian Synchrotron. We’re having a few ‘spooky’ themed posts this week, kicked off with dry ice so how about a green glowing mineral? Quite a number of minerals will ‘glow-in-the-dark’ mainly as a result of florescence after exposure to UV radiation. Willemite is a zinc mineral, which fluoresces green because of manganese impurities with the crystal structure. This effect is strong enough that artificial Willemite was used in developing the first fluorescent lamps. Willemite is usually produced as an alteration from sphalerite, and is name after William I of the Netherlands. Boron and carbon – better together? 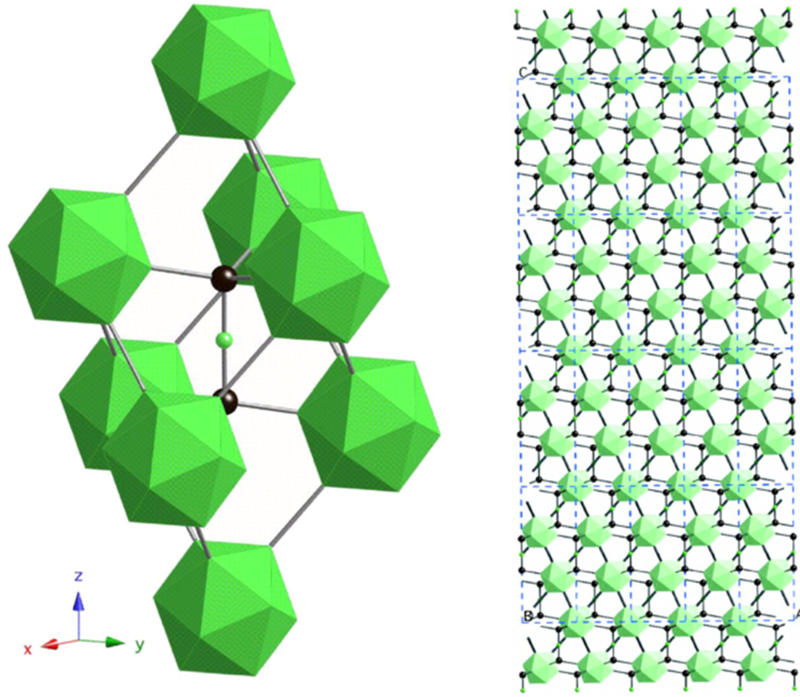 The ideal arrangement of Boron Carbide, layers of green boron clusters with the black carbon atoms between them. Boron carbide is a material that was discovered by accident in the 19th Century, and is (aside from boron nitride and diamond) one of the hardest materials known. Being cheaper to produce means that it is used for armoring tanks and in bullet-proof vests. Unlike the super hard materials diamond and boron nitride, it’s crystal structure actually quite complicated. It’s known to have a roughly 4:1 ratio of boron to carbon atoms, but closer examination revealed that in practice there is always less carbon than expected in the structure. This deficiency of carbon atoms leads to some complexities in the crystal structure, which have been debated since the 1940’s. Current thinking is that the structure is actually made up of a mixture of clusters of boron some associated with more carbon and some with less. We’ve pictured the ‘ideal’ arrangement of Boron carbide, but you can get an example of how complex the determination of this structure is from entry #2235962 in the Open Crystallography Database. It has been a while since we’ve featured an element’s crystal structure on the blog. It’s been said before but we’re continually fascinated that, despite the fact that these crystal structures are made up of just one building block, they can form a whole range of beautiful structures. Today’s element is no exception to this, boron sits on the top row of the periodic table – it’s the 5th element on the list. One of the features of boron as an element is that it forms clusters with itself. 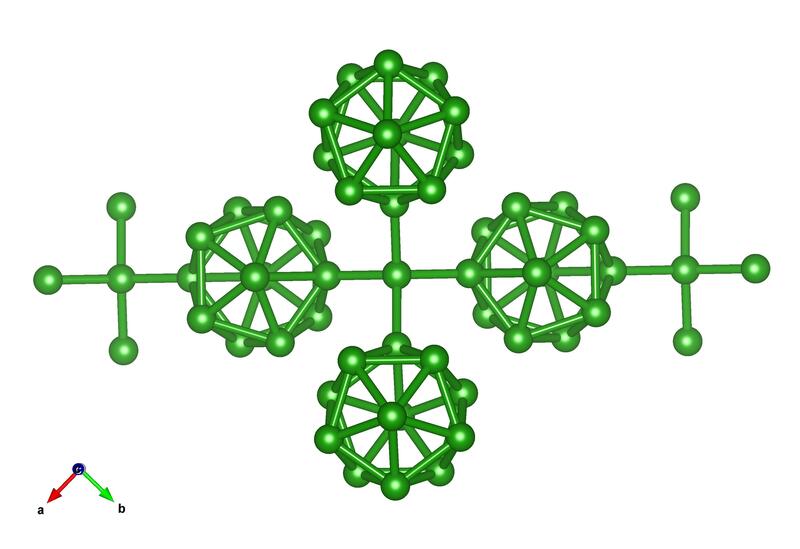 Clusters of 6 atoms, and two arrangement of 12 atoms , and now even a ‘buckyball’ structure. When you start combining this boron clusters with rare earth elements, then a whole range of interesting properties start to emerge. Many of these materials have been observed to have low thermal conductivity, making them potentially great candidate materials for helping generate thermoelectric power. There’s a wikipedia page that someone has put a lot of crystallographic love into on these materials, in particular scandium and boron complexes. We’ve featured one of the first crystal structures of boron, its rare alpha tetragonal allotrope. This was determined in 1951 by Hoard et al, from ‘needle like’ crystals and is reported as a short note in JACS. The structure is #9012288 in the Open Crystallography Database. Solid carbon dioxide, aka, dry ice is a well-known cooling agent amongst meat packers and ice cream makers. Where at normal atmospheric pressure, water freezes at 0 degrees C, CO2 solidifies at -78.5 degrees C. Besides its lower temperature, dry ice’s main advantage over water ice is that it is a refrigerant with no liquid residue. That is, it goes from solid to gas without an intervening liquid phase (at least at normal atmospheric pressure); a process called sublimation. Dry ice is also popularly used in smog machines. High pressure and temperature phases of solid CO2 are especially important for understanding planetary interiors [2-3] and star formation . Like solid water, solid CO2 has several polymorphs . So far there have been 7 different polymorphs of solid CO2 identified. Below is the phase diagram of solid CO2 at high temperature and pressure. Phases I, III, and VII are typical molecular solids, while phases V and VI are extended phases similar to those of silicate (SiO2). Phase II is a poorly understood intermediary phase. The nature of phase IV is starting to come into view. Normally CO2 is a linear molecule with double bonds between the carbon and oxygen atoms. In 2002 Park, et. al. reported results suggesting that phase IV has a bond length 30% larger than in phase I and were no longer linear, exhibiting an OCO angle of 160° . However, such a distortion was in conflict with other experimental and theoretical results, and a strong debate emerged about the actual structure of this phase. In 2009 Datchi, et al, reported an X-ray structure of a single crystal of CO2 in phase IV that did not exhibit this bent structure . Instead they found the structure to be rhombohedral, space group R-3c, with 8 molecules in the primitive unit cell. The C=O intramolecular bond length was found to be slightly smaller (1.155 Å) than the one of the isolated molecule. Iota, et. 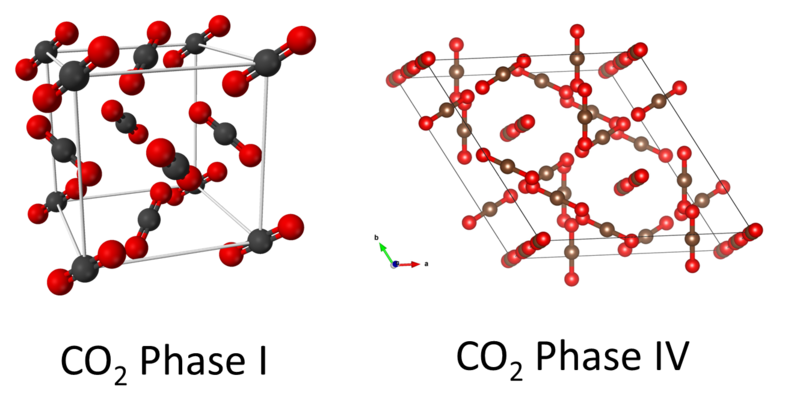 al., reported results indicating that that phase V is an extended covalent solid with carbon-oxygen single bonds,  a result subsequently confirmed by Santoro, et al.,  and Datchi et. al. . Seto, et. al., likewise solved the crystal structure of solid CO2-V which is consistently interpreted in terms of a tetragonal unit cell . Sun, et. al., reported that phase VI is also amorphous, layered and tetrahedral . These results also suggest that CO2 may be present in the Earth’s mantle with structures that are similar or identical to structures of SiO2 having either 4- or 6-coordinated carbon atoms. The totality of the all the investigations of solid CO2 reveal a very complex picture of changing structure as a function of temperature and pressure. There are still several open questions and a need for perhaps new techniques in x-ray diffraction to resolve some of the issues. What is also interesting about this line of research is the role of electronic structure calculations [12,13] and complimentary experimental methods, e.g., x-ray Raman spectroscopy . 1. Yoo, C., et al., Crystal structure of carbon dioxide at high pressure:“Superhard” polymeric carbon dioxide. Physical Review Letters, 1999. 83(26): p. 5527. 3. Malin, Michael C., Michael A. Caplinger, and Scott D. Davis. “Observational evidence for an active surface reservoir of solid carbon dioxide on Mars.” Science 294, no. 5549 (2001): 2146-2148. 4. Nummelin, A., D. C. B. Whittet, E. L. Gibb, P. A. Gerakines, and J. E. Chiar. “Solid carbon dioxide in regions of low-mass star formation.” The Astrophysical Journal 558, no. 1 (2001): 185. 5. Datchi, Frédéric, Valentina M. Giordano, Pascal Munsch, and A. Marco Saitta. “Structure of carbon dioxide phase IV: Breakdown of the intermediate bonding state scenario.” Physical review letters 103, no. 18 (2009): 185701. 6. Park, J-H., C. S. Yoo, V. Iota, H. Cynn, M. F. Nicol, and T. Le Bihan. “Crystal structure of bent carbon dioxide phase IV.” Physical Review B 68, no. 1 (2003): 014107. 7. Iota, V., C. S. Yoo, and H. Cynn. “Quartzlike carbon dioxide: An optically nonlinear extended solid at high pressures and temperatures.” Science 283, no. 5407 (1999): 1510-1513. 8. Santoro, Mario, Federico A. Gorelli, Roberto Bini, Giancarlo Ruocco, Sandro Scandolo, and Wilson A. Crichton. “Amorphous silica-like carbon dioxide.” Nature 441, no. 7095 (2006): 857-860. 9. Sun, Jian, Dennis D. Klug, Roman Martoňák, Javier Antonio Montoya, Mal-Soon Lee, Sandro Scandolo, and Erio Tosatti. “High-pressure polymeric phases of carbon dioxide.” Proceedings of the National Academy of Sciences 106, no. 15 (2009): 6077-6081. 10 Datchi, Frédéric, Bidyut Mallick, Ashkan Salamat, and Sandra Ninet. 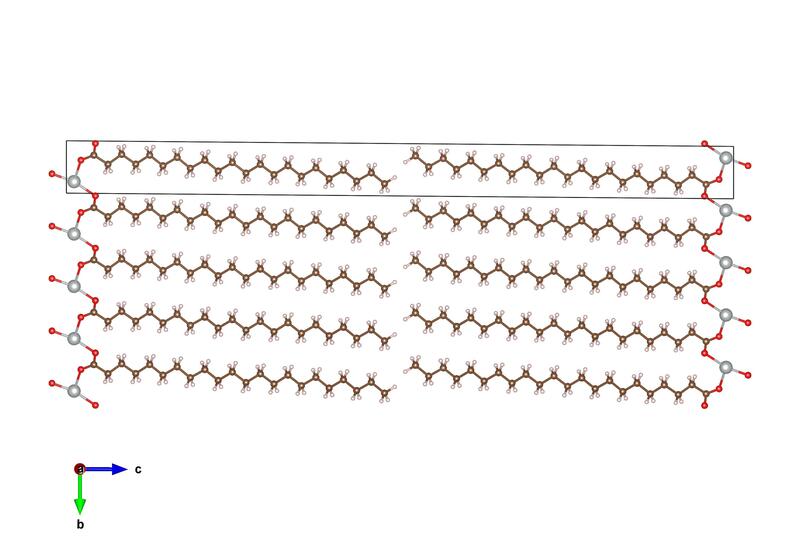 “Structure of Polymeric Carbon Dioxide CO2-V.” Physical Review Letters 108, no. 12 (2012): 125701. 11. Seto, Y., D. Nishio-Hamane, T. Nagai, N. Sata, and K. Fujino. “Synchrotron X-ray diffraction study for crystal structure of solid carbon dioxide CO2-V.” In Journal of Physics: Conference Series, vol. 215, no. 1, p. 012015. IOP Publishing, 2010. 13. Li, Jinjin, Olaseni Sode, Gregory A. Voth, and So Hirata. “A solid–solid phase transition in carbon dioxide at high pressures and intermediate temperatures.” Nature Communications 4 (2013). 14. Bonev, S. A., Francois Gygi, T. Ogitsu, and G. Galli. “High-pressure molecular phases of solid carbon dioxide.” Physical review letters 91, no. 6 (2003): 065501. 15. Shieh, Sean R., Ignace Jarrige, Min Wu, Nozomu Hiraoka, S. Tse John, Zhongying Mi, Linada Kaci, Jian-Zhong Jiang, and Yong Q. Cai. “Electronic structure of carbon dioxide under pressure and insights into the molecular-to-nonmolecular transition.” Proceedings of the National Academy of Sciences 110, no. 46 (2013): 18402-18406. Magnesium chloride a very simple material, with a lot of uses – from roads to antiseptic to tofu. 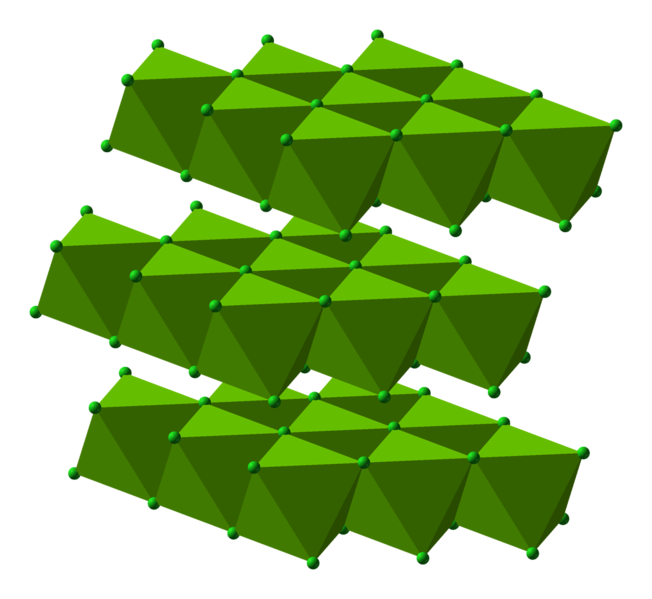 As you can see from the image of ti’s crystal structure it forms in layers – with the magnesium and chlorine atoms forming octahedra that are joined together. This means there is lots of room for water to also to join between the layers and form a magnesium chloride hydrate. There’s lots more on this material in the latest Chemistry World podcast from Brian Clegg that you can listen to here. Magnesium chloride is #9009129 in the Open Crystallography Database. This is one of the materials behind thermal printing, it’s a dry material that when exposed to heat leaves behind silver nanoparticles that are capable of absorbing enough light to be viewed. It also has a really interesting diffraction pattern, with strong peaks at low angles from the large spacing between the silver atoms. This means it’s been really useful as a standard for people doing small angle diffraction. The crystal structure of silver behenate was determined from powder diffraction in 2011 by Blanton et al, and you can find it in the Open Crystallography Database, #1507774.